One of the biggest misconceptions circulating on the Internet today is that our skin is a giant sponge, absorbing everything we put on it. This is so prevalent, that many people are more concerned about what they put on their body than they are about what they put in it. Last summer we sold our products at a local community market, and I was chuckling at the fact that customers were grilling me over every ingredient in my lotions, but purchased multiple canned and baked goods without inquiring as to the whether they contained trans fats, high fructose corn syrup, etc. The reality is that our skin is designed to protect our bodies from the countless things that bombard it on a daily basis (heat, cold, dirt, pollution, bacteria, sun, wind), and keep things out of our bloodstream, while our digestive system is designed to process everything we eat into energy that is relayed directly into the bloodstream. I pulled this quote from a blog, which I will leave as anonymous as there are so many I could have chosen, and I’m not here to point fingers at inaccuracies or errors by another blogger. The reality is that it takes a lot of work to get medicine into the bloodstream, which may include potent penetration enhancer, application of electrical currents, or even patches containing micro needles, to push the drug through all the layers of the skin to the bloodstream. It also requires that it be covered to prevent evaporation, and the patch must be held securely against the body for a prolonged period of time, ranging from several hours to days. Even with these special measures, when a transdermal patch is removed, a high percentage of the drug that was on the patch initially remains on the patch. A study done using the narcotic Fentanyl showed that after 3 days of continuous wear, up to 84% of the original dosage remained on the patch, requiring special disposal methods to prevent potential narcotic abuse. Without the dermal patch and penetration enhancers, the absorption rate drops to around 4%. This does not mean that we should stop caring about what we put on our skin, but we should definitely start thinking of it more as a Kevlar vest, which requires some effort to get through, rather than as a giant sponge…. How does this apply to products such as preservatives? The maximum recommended usage rate for preservatives in cosmetics is between .5% and 1%. If you purchase an 8 oz bottle of body lotion, then the maximum amount of preservative in the bottle is .08 oz. As no more than 4% of what we apply to our skin makes it through the dermal barrier, that means no more than .0032 oz of preservative makes it through the skin, with even less than that making it through into the bloodstream…..that’s less than 1/300th of an ounce of preservative if you use the entire bottle of lotion. Compare that to the risk of contamination from preservative free lotions. I can hear the wheels turning….if so little of our lotion penetrates the skin and moves into our bloodstream, then the risk from using a preservative free lotion must be equally low, right? Yes and no. 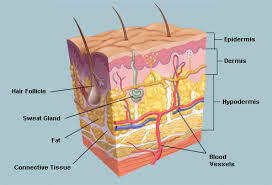 A contaminated lotion will penetrate our skin just as poorly as a preserved lotion, but there are two factors to consider: a small amount of preservative will not cause problems for a system that is designed to flush out what the body doesn’t need….preservatives are regarded by the body as a foreign substance. Bacteria, such as eColi, staphylococcus, and salmonella, however, are living organisms which immediately latch on to healthy cells and begin to multiply, and only a small amount is required to start the potentially deadly ball rolling. The other wild card that we need to consider is that those absorption rates apply only to healthy skin. If the skin is damaged by a cut or has been compromised by illness, sunburn, or even dehydration, penetration will occur at a higher rate. This isn’t of too great a concern when we are speaking of the ingredients in a properly made lotion, but bacteria will take full advantage of any small chink in the body’s armour. So, if you have a friend or relative who is chronically ill, suffers from eczema, or is going through chemotherapy, stay away from preservative free lotions or body butters. If you are still anti-preservative, a better choice would be an anhydrous (contains no water) product such as a whipped body butter. No water = no environment for bacteria and mold to grow. Okay, this post is definitely approaching “run on” territory, so I’m going to leave the issue of the absorption of essential oils through the skin for tomorrow!